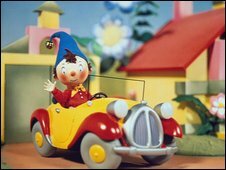 Children's favourite Noddy will venture into new global markets to celebrate his 60th birthday, parent company Chorion has said. It wants to take the character, created by Enid Blyton in 1949, to Spain and Canada for the first time as part of its anniversary plans. Chorion has already launched a new 52-part TV series for the character. The company, which owns the Mr Men and Paddington Bear brands, also announced a big jump in global sales. For the year to the end of March, revenue rose 35% from the previous year, to £53.7m. "Our brands are working and they are working outside the UK - the big growth area for us is the US," said Chorion chairman Waheed Alli. He estimated that the company was selling about one million Mr Men T-shirts a month in the final three months of last year in the US. Part of the reason for the company's strong performance, he said, was a yearning for familiarity in uncertain times. "We've noticed a drift from new to classic. People are looking for security and we've seen a huge uplift," said Lord Alli, a Labour peer. Chorion brands can now be found in 30 countries, he added.